Construction Projects – HVAC Inc.
HVAC, Inc. has earned its reputation as a leader in the HVAC Industry by serving the public sector and delivering on large, public construction projects for more than thirty years. Among the many that deserve recognition is the Tuttle Avenue School in Eastport, NY. HVAC, Inc. built the geothermal heating system at this 60,000 square foot school, which derives heat from five wells drilled down to 160 feet. A core component of the facility’s environmentally sustainable design, the building achieved LEED gold certification. In addition, HVAC, Inc. has also undertaken massive district-wide projects. In the Deer Park School District, working in collaboration with Johnson Controls, the company converted the facilities from steam to hot water systems and designed and installed new control systems for them. The same project specifications were executed at the Sewanhaka School District, where the company built, designed and installed new control systems at both high schools, one of which is the largest on Long Island. 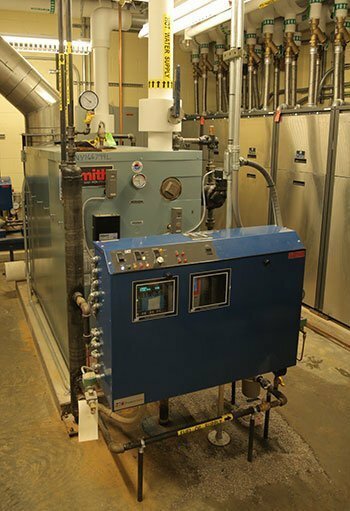 A growing number of school districts are committing to cogeneration, and HVAC, Inc. has built systems at more than ten schools including Brentwood High School and Massapequa High School. The company has been developing a presence very rapidly in the private sector in the Greater New York area as well and has handled the mechanical aspects of new installations for Pret a Manger, CVS and the New York Sports Club and BFX Studios divisions of Town Sports International.